Here at The Shade Store, we are so excited to announce the launch of our newest product: The Day Night Cellular Shade. We are introducing this new line in response to the ever-growing desire for streamlined control of both light and privacy. 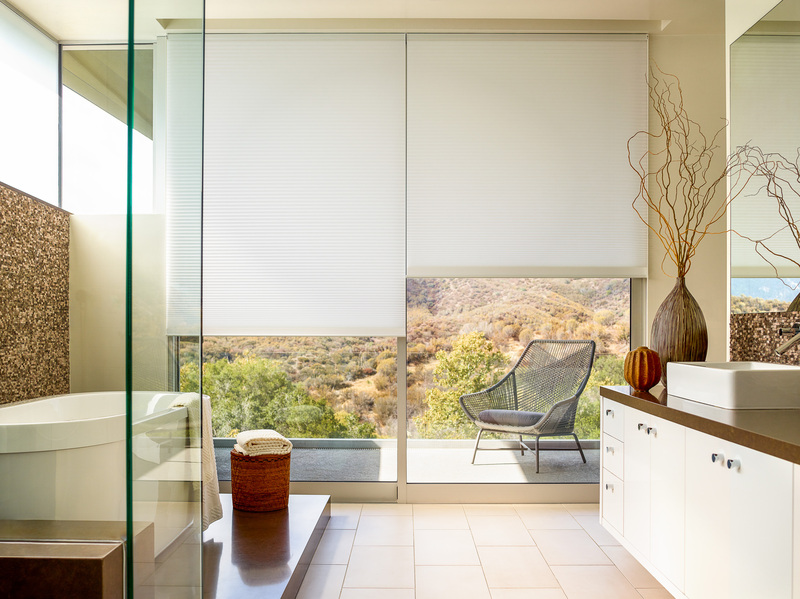 These versatile cellular shades provide a unique two in one solution – allowing for the use of both a sheer material for privacy and a blackout material for light control, depending on your changing needs throughout the day. You can switch between a complete light filter, a complete blackout, or a combination of both filters at the same time (as seen below!). For this reason, this product is commonly referred to as a “combination shade”. Day Night shades are great for bedrooms that get great sunlight during the day, while controlling outside light at night. They’re also perfect for bathrooms as they strike the balance between privacy and light control. Our Day / Night Shade is a new addition to our pre-existing Cellular Shade Collection. As with all of our cellular shade options, the day night shades are a great choice for year-round insulation. They help keep energy costs low in both warm and cold climates. The Day / Night Shade has four day materials and 7 night materials to choose from, so it can be customized just for your home and style! Customize your own day and night shades and order your free swatches today. As always, we are proud to bring the best to our clients. 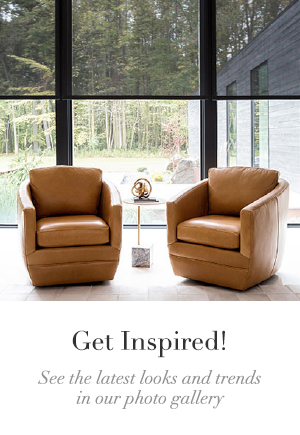 To learn more about our newest products, visit one of our 55+ nationwide showrooms, give us a call, or email us at design@theshadestore.com! Energy efficiency is a popular topic among homeowners these days. Solar panels, programmable thermostats, and other high-end technologies have become standard, but most home builders will agree that one of the most vital components of a high-performance home is its windows. People often only view window treatments as a way to dress up their windows, not realizing the additional benefits. 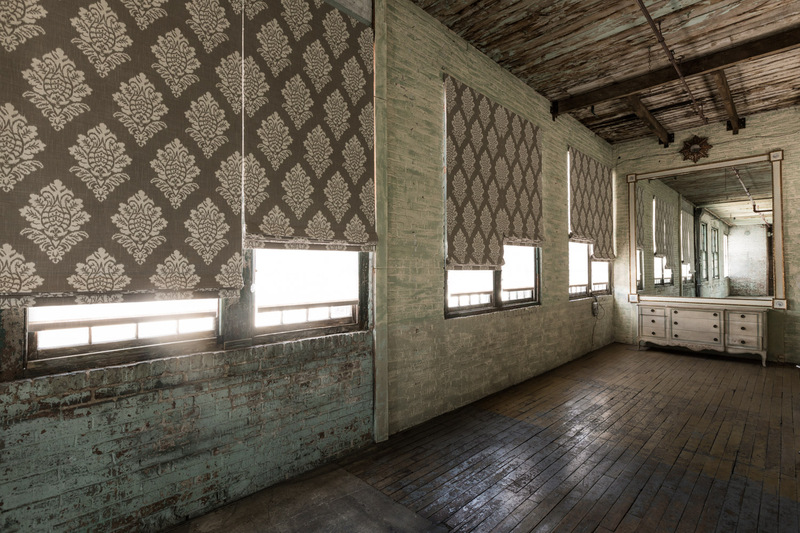 However, Shades and Drapery can also be a great way to help keep energy costs low! Here at The Shade Store, we have several different options for energy efficient window treatments. Our Cellular Shade collection includes over 50 exclusive materials including light filtering and blackout options, with both single and double cell sizes available. Not only do Cellular Shades provide a sleek look, but they also act as insulation, protecting the home from cold or heat, depending on the season. They keep energy costs down year-round! Solar Shades in 5% White. Design by D2 Interieurs. Our Solar Shades are available in over 100 exclusive eco-friendly materials. We carry four transparency levels: 1%, 3%, 5%, and 10%. The lower the openness percentage, the more privacy and protection you will receive. All of our Solar Shades offer UV protection, fade prevention, and glare reduction. They also absorb heat, which is a great way to keep cooling costs down in warmer climates! Solar Shades are a great selection if you’re looking for the sleek and minimal aesthetic of a Roller Shade, but want the added efficiency only a Solar material can provide. If you’re looking for a wider variety of designs and patterns for your window treatments, both Roman Shades and Drapery are suitable selections. Both styles are available in over 550 exclusive fabrics, including patterns by some of the best designers in the business. If energy efficiency is a concern, Roman Shades and Drapery also have the added advantage of reducing drafts with interlining. 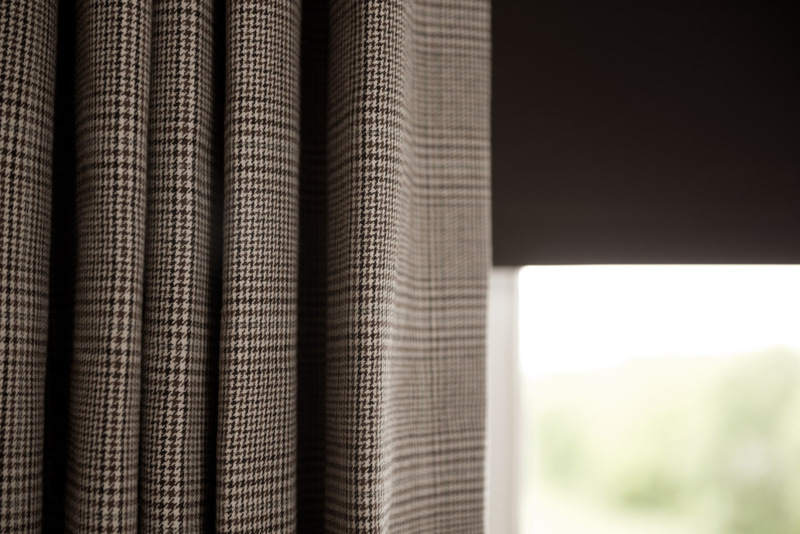 The cotton flannel interlining is sewn into place between the front fabric and the privacy lining on the back of the shade or panel. The extra weight adds body and fullness to your window treatments, while also insulating your home! This choice is perfect for older homes and drafty windows. If you have questions about energy efficient window treatments, reach out to our expert Design Consultants by email at design@theshadestore.com, or in one of our 55+ nationwide showrooms. Choosing window treatments for bay windows can be tricky. Should each window be treated individually, or should the group be viewed as one large window? Where should shades be mounted? What about drapes? There are no right answers to these questions, and each bay window can be dressed a multitude of ways. We have collected a few of our favorite bay window treatment ideas with shades and drapes to provide you with some inspiration. If you have narrow bay windows in your home, you may be worried that individual shades on each window could look awkward and too small. One way to combat this problem is to coordinate the color of your shades with your trim color. These Cellular Shades are inside mounted, so the trim of the windows is still on display. All three shades are white and have a blending effect with the trim, minimizing the narrowness of the separate windowpanes. 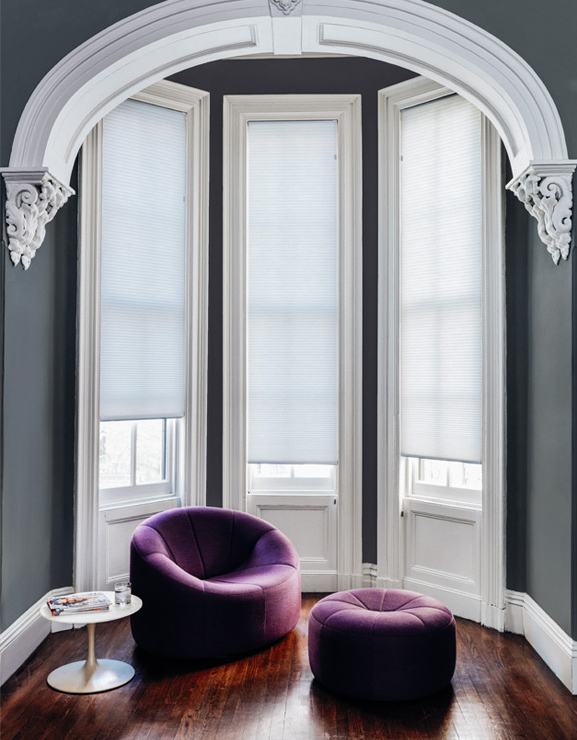 Cellular Shades are uniquely well suited to bay windows because of their insulating power – perfect for both colder climates and very sunny areas. Another way to make narrow windows look larger is to mount Roman Shades on the outside, so they maximize the width of the window area. 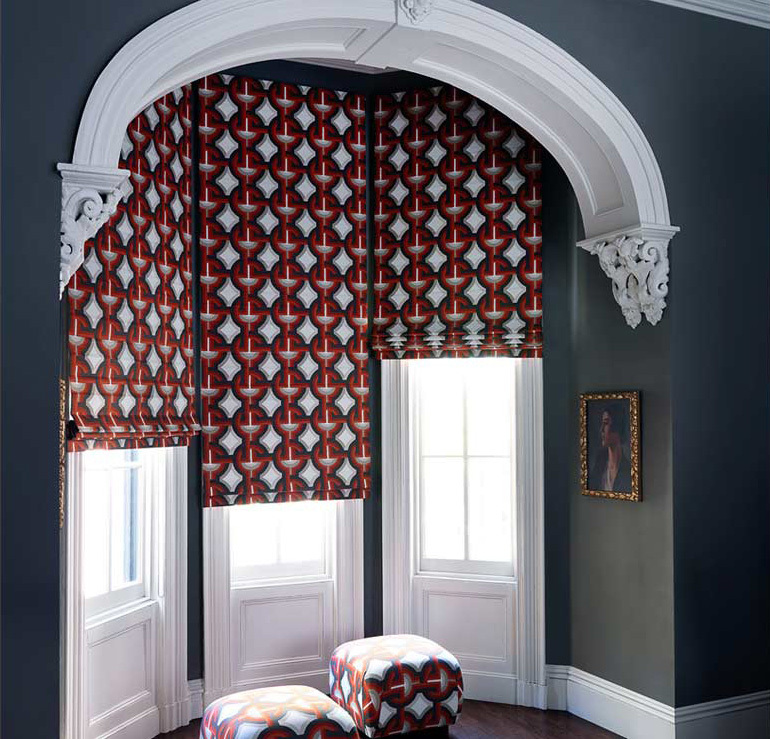 Flat Roman Shades were mounted close together, forming a single visual unit with the bold pattern. If you have other interesting architectural details around your bay window, such as the detailed molding on the arch in these photos, a simpler style of shade like the Flat Roman will allow those details to shine while still providing interest with color and the softness of a fabric accent. When all three shades are raised, the neat stack of the Flat Roman can give the illusion of a fabric valance. If you’re struggling with finding a drapery style you like for a bay window, consider Roman Shades, which add the same softness and fullness with fabric without the considerations of rods or length. What about wide bay windows? Layered shades and drapes look beautiful together on large sets of windows. Our custom shades can be made in wide widths, so make sure to talk to a design consultant about your options if you have a wide window. The Flat Roman Shades pictured below are available up to 120” wide. The sheer material keeps the large shades from feeling too heavy. Finally, Tailored Pleat Drapery frames the whole window unit. 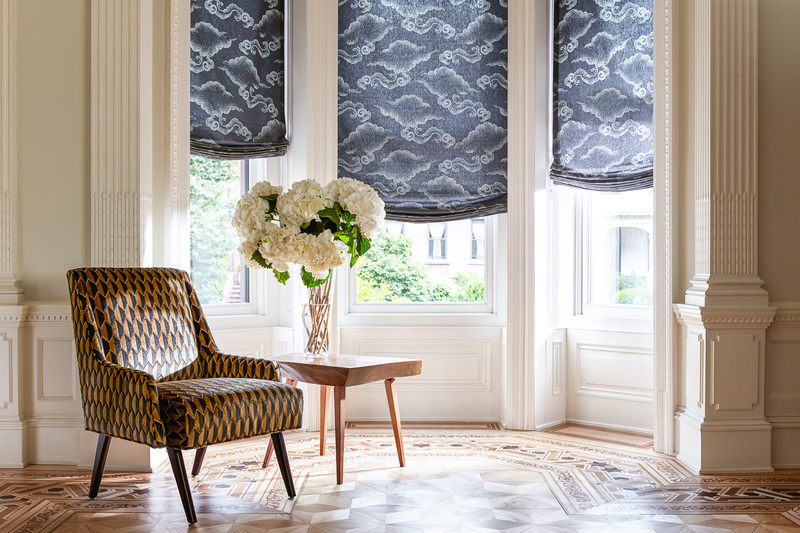 For a dose of natural texture, Woven Wood Shades add instant interest to a bay window. These shades are an outside mount, forming the look of one cohesive shade and the versatility of raising and lowering each section one at a time. For more help with your bay window treatments, visit one of our nationwide showrooms or call us at (800) 754-1455. And don’t forget our Free Photo Rendering Service, where one of our design experts will render your window treatment ideas into a photo of your room. 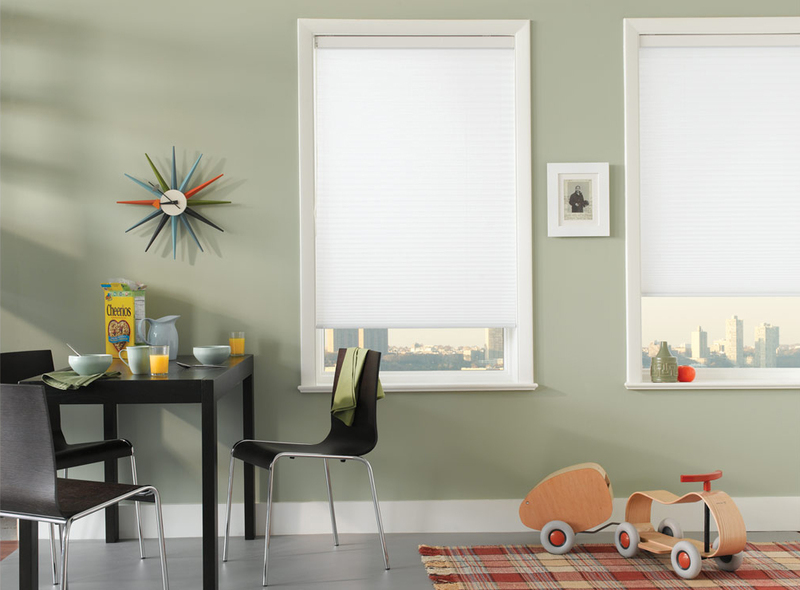 Cellular shades, also known as honeycomb shades, are truly high performance window treatments. Not only are these shades stylish and functional, they are also the best option for insulating your windows. If you’re looking for the ultimate shade in light blockage, privacy, and energy efficiency, try a blackout cellular shade. 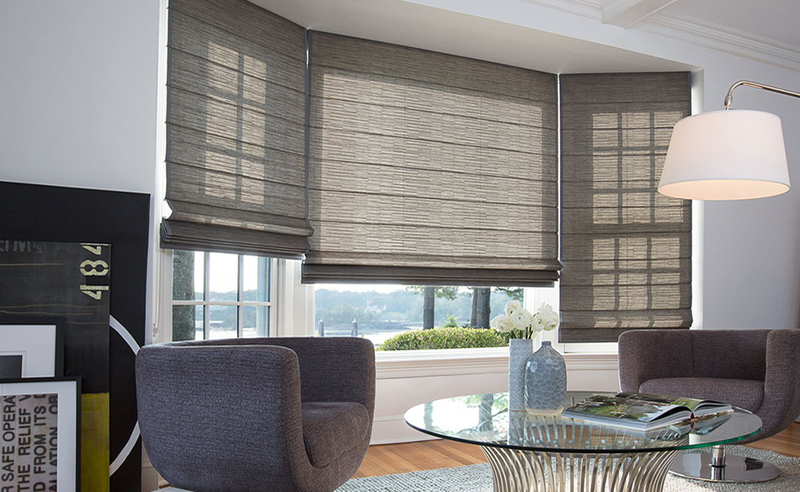 Blackout cellular shades are incredibly versatile, and go far beyond the simple white shade you’ve probably seen many times before. To start with, we offer 16 eco-friendly blackout materials in both solids and prints, from Mocha to Midnight to Mirage Blackout. 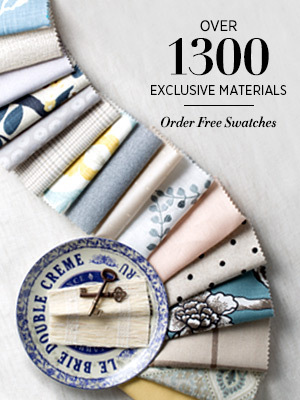 View all the cellular shade swatches here. You can also choose from two sizes of cells for your blackout shades, which provide differing levels of insulation. Our 3/4” Single Cell blackout cellular shades, shown in the photo above, feature one layer of cells. This larger size cell is well suited for big windows. 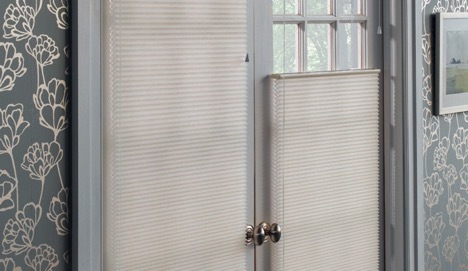 The 3/8” Double Cell cellular shades have two layers of cells, and create a smaller pleat as shown below. Double cell blackout cellular shades grant the highest level of insulation. Cellular shades can be raised and lowered with the standard cord lock, but continuous loop and cordless options are available, too. With the standard cord lock, you can opt for the Top Down Bottom Up style (shown above) which allows you to lower the shade from the top, as well as raise it from the bottom. 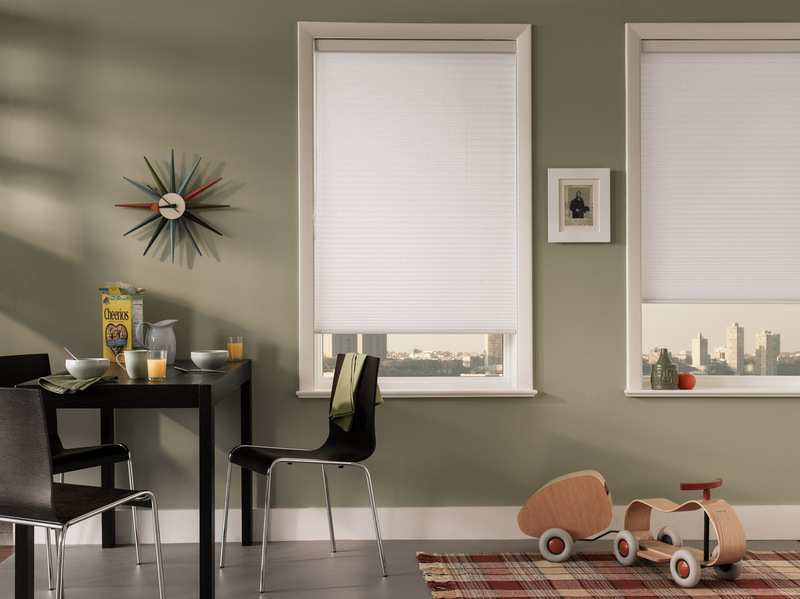 If you’re planning on using cellular shades in a child’s bedroom, our cordless shades have been certified Best for Kids in association with the Window Covering Manufacturers Association (WCMA). 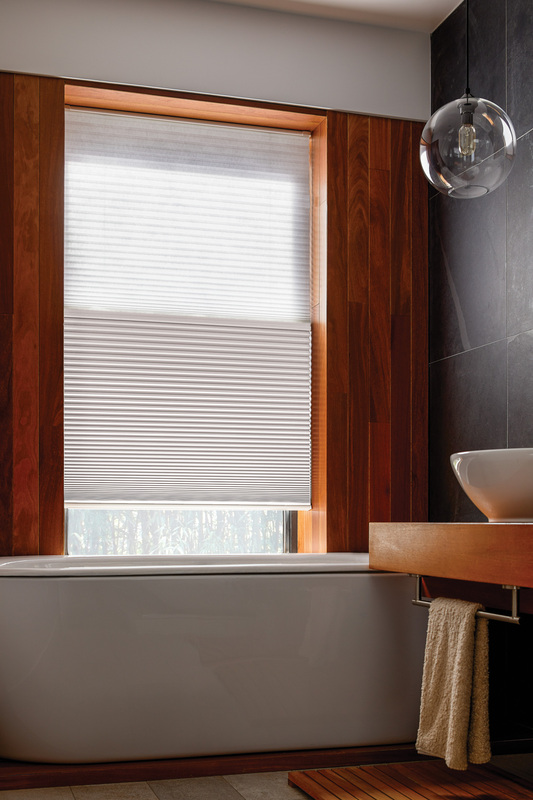 Blackout cellular shades are an excellent choice for energy efficient window treatments. With windows accounting for 25% of heat loss in homes, these insulating shades can make an impact on your home’s energy consumption. How do they work? Cellular shades are made up of cells created by folds in the shade material, and these cells can trap air, providing a layer of insulation over your windows. Blackout cellular shades go even further and block heat, light, and damaging UV rays when closed during the day, making it easier to maintain a constant temperature indoors. Choosing blackout cellular shades is a smart decision for your home. 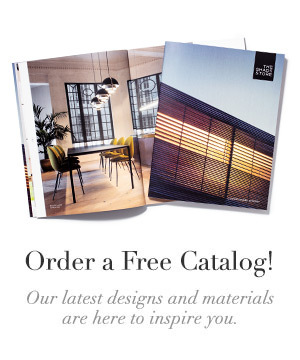 Customize your cellular shade online, or visit a showroom to see them in person. We can’t wait to help you find the perfect shade. Hot enough for ya? Summertime has a way of spiking energy costs. Air conditioners and fans are working overtime to keep you cool and comfortable, but there’s always that feeling of dread when energy-bill time rolls around. We have a few window treatment ideas that will improve the insulation of your home, keep your thermostat in check, and help lower your energy costs. Also known as “honeycomb shades”, cellular shades have a unique cell design that helps trap air within the shade. This maintains interior temperatures by preventing warm outside air from getting inside. Pretty cool, huh? Cellular shades are available in light filtering and blackout materials, with the latter providing a cooler result (less light, cooler interiors). There are also single and double cell materials, with double cells providing maximum insulation and temperature control. Pinch pleat drapery in a heavy Manor fabric. Have drafty windows? Hang something heavy in front of them. Seems obvious, right? But not everyone is aware of this simple tip. 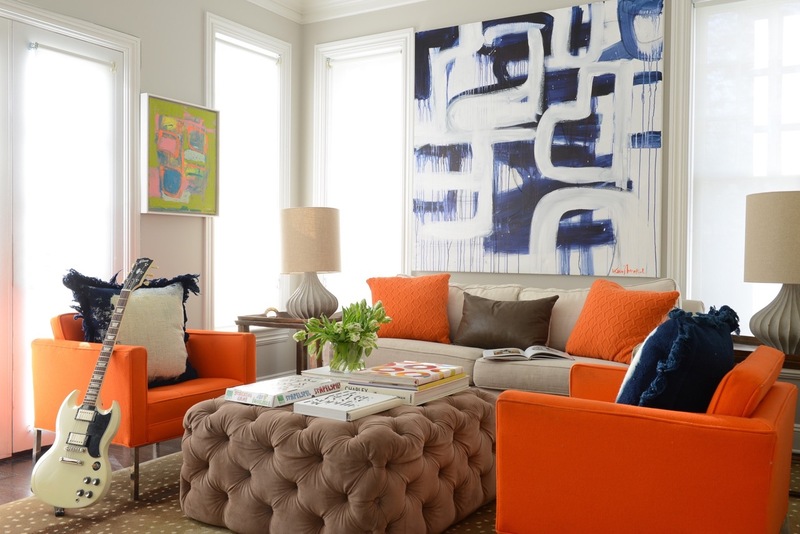 Select a heavy fabric like wool, velvet or suede when customizing your drapery. The heavier the fabric, the more stopping power it has. Our draperies can also be customized with special linings – Privacy, Blackout, or Privacy + Interlining. While all linings will add body and weight, the Privacy + Interlining is specifically designed with a cotton flannel material for improved insulation. 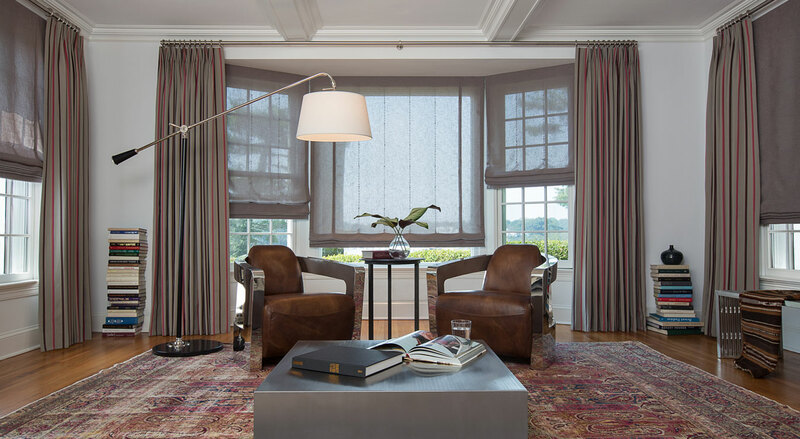 Speaking of linings, did you know all of our roman shades can be outfitted with linings at no additional cost? This includes our Privacy + Interlining option! Since draperies and romans are made from the same fabrics, the same rules apply here: heavy fabric + lining = draft-stopping insulator. To learn more about how custom window treatments can help insulate your home and lower energy costs, speak to one of our design consultants today.